Shown to be 40 times more effective at acquiring customers than Facebook and Twitter combined, email remains a key driver for growth as part of the broader omni-channel marketing strategy. 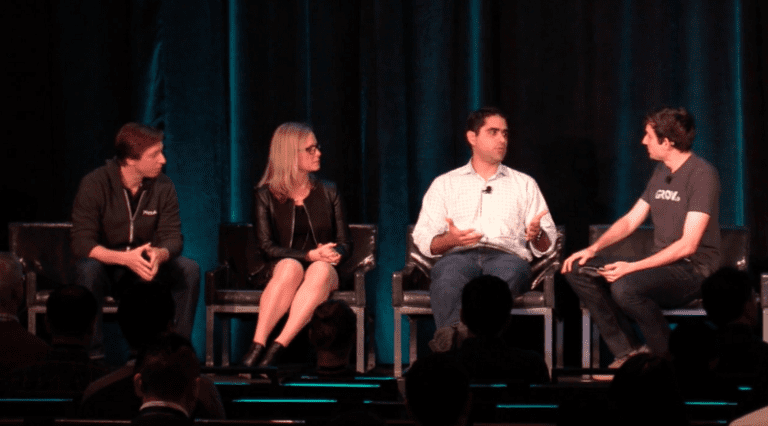 Engaging users with relevant, personalized messaging is more important than ever when it comes to this essential channel. While you are working hard to come up with the right email marketing strategy for your business, it certainly helps to consider how the top players are doing their job and then apply best practices to your organization. To help you improve your own campaigns, we’ve prepared our first User Engagement Top 100 Report. The Q1 2017 edition focuses on email marketing in e-commerce, covering the tactics of the top 100 e-retailers in the U.S. during the busy December holiday season. This report includes industry stats, real-life email examples and our own recommendations of how to successfully compete for user engagement. Welcome campaign: Did the company send out a welcome email after signup? If so, how many welcome emails did each company send? What details were included in each email? Cart abandonment campaign: While logged in on each e-commerce site, we added an item to the shopping cart and left the site without checking out. How did each company react? Blast campaign: Within one week after the new user account was created, how many blast emails were sent in total by each company? 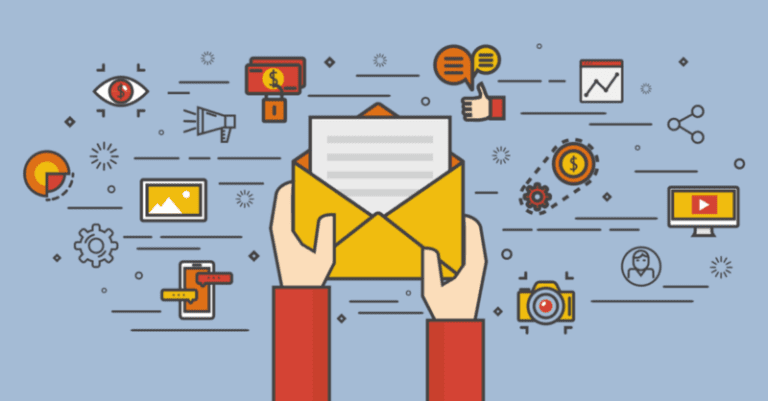 Which industries tended to send more blast emails? To give you a glimpse of the good stuff you will find in this report, here are some of the key takeaways. Welcome emails are widely adopted by e-commerce companies. 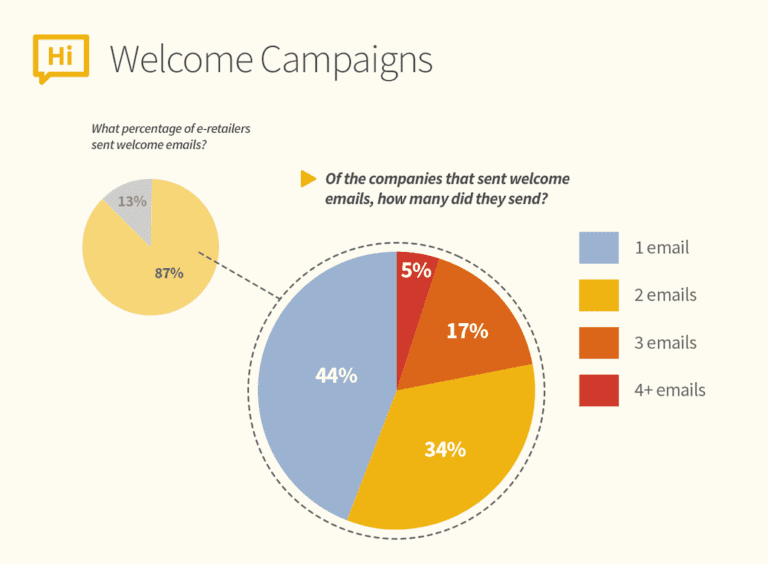 The majority (87 percent) of the studied sites send out at least one welcome email to new users. However, cart recovery campaigns are not as popular with e-retailers. Only 50 percent of the studied companies react to cart abandonment actions. Surprisingly, 43 percent of e-commerce companies did not send a single email blast within a week of a new user signup. You’ll also learn other valuable metrics, such as the number of emails sent for each campaign type, the specific companies that were caught by spam filters and what kinds of discounts are most commonly included. 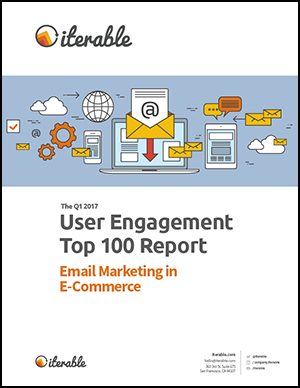 We hope you gain valuable insights from the User Engagement Top 100 Report: Email Marketing in E-Commerce. Like what you see and want to learn how our email recommendations can bolster your omni-channel marketing strategy? Request a demo today.